Jim Thome brought a positive attitude and a powerful bat to the Cleveland Indians, helping lead the struggling franchise to the World Series twice. 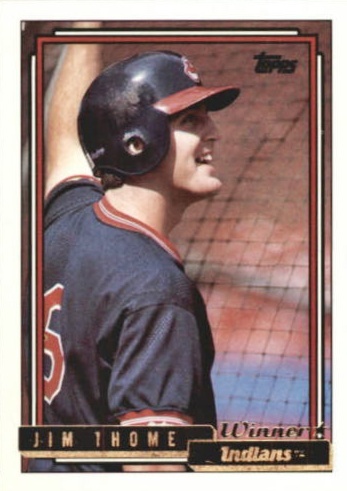 Starting with options in 1991, Jim Thome rookie cards were quickly popular thanks to his amazing home run pace. Enjoy some of the best Jim Thome cards including key rookies and limited inserts from the 1990s. 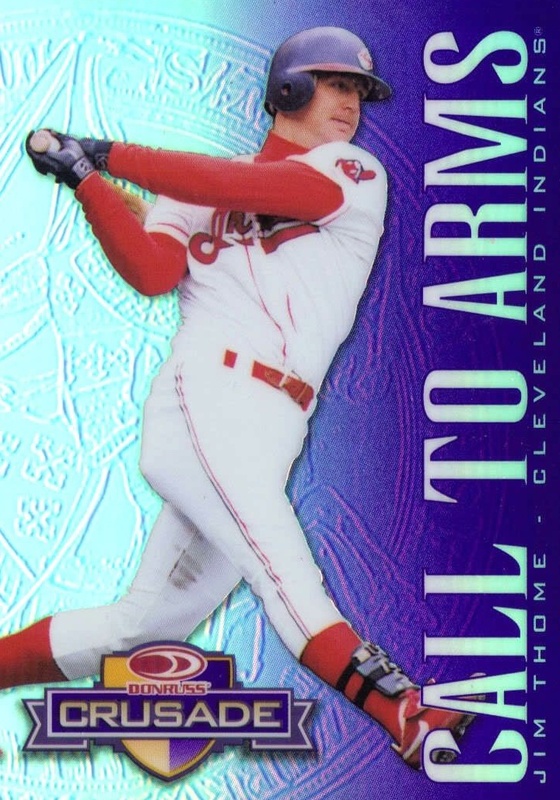 Initially a prospect at third base, Thome is featured at the hot corner on all of his early trading cards. He was moved to first base where he would find success until injuries pushed him to DH. Over his long career largely spent with the Indians, Phillies and White Sox, Thome surpassed 600 career home runs, cementing his Cooperstown credentials. Shop for Jim Thome autograph cards on eBay. While Thome is known to be a frequent in-person and through-the-mail signer, his autographs largely stopped appearing in card sets after 2008. That changed in 2017 when he began signing for Topps again, including 2017 Bowman's Best and Topps Dynasty. Two notable Jim Thome dual autographs from his playing days include 2006 Upper Deck Sweet Spot, paired with Ken Griffey Jr., and in 2007 Upper Deck Premier with Willie McCovey to celebrate Thome reaching 500 home runs. One of Jim Thome's most valuable modern cards is a super short-printed variation in 2012 Topps Update. Jim Thome's eligibility for the Baseball Hall of Fame got underway in 2018 and many felt that his performance during the height of the steroid era, without suspicion of using steroids, made him a lock for Cooperstown. Those people were correct as he is a first-ballot Hall of Famer. As a result, key Jim Thome baseball cards should see an increase in demand, along with his signature. In ranking this list, the card's value is used as the main factor along with design. The 1992 Topps set not only gave fans the option to collect a gold parallel of each base card, it also included a scratch-off in every pack with the chance to earn "Winner" cards. These ended up being not quite as rare as Topps originally hoped because fans discovered holding the scratch-off cards to a bright light revealed the correct pattern to scratch. Still, this is the premier edition for Thome's Topps flagship debut. 1999 Topps Tek features just 45 players on its checklist but each player has two cards in the set: an "A" and "B" card. Fans can easily tell the difference by the uniform, with home jerseys featured on the "A" card and away jerseys on the "B" card. 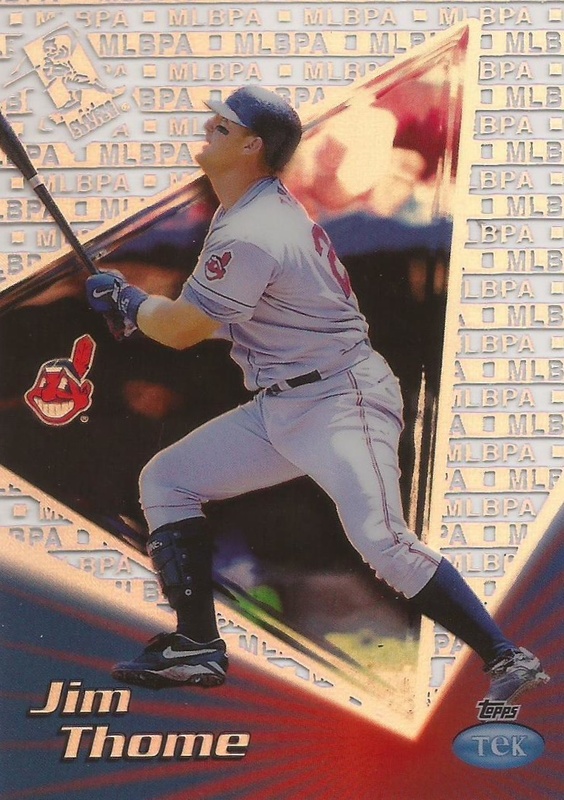 In addition, Thome finishes his swing on the "B" version while "A" is pre-swing. Each of his cards has 30 different background patterns, giving him a staggering 60 total cards to collect. Within the 1999 Fleer Brilliants base set, each player in the 175-card checklist has three additional parallel versions. Blue is the most common and features a swirling background. Amping up the rarity, the gold version is serial numbered to 99 copies. However, the most limited is the 24kt gold version shown below. It features a 24kt gold stamp in the upper-right corner and is kept at just 24 copies. Pinnacle issued 1995 Select Certified as an add-on to the standard Select, but they upped the card quality with Certified having twice the card stock. 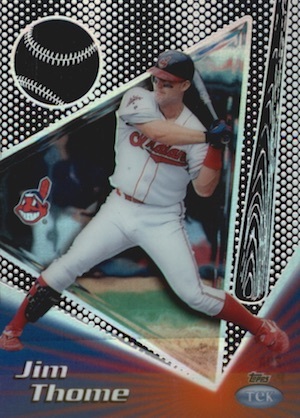 The Jim Thome card features him snagging a line drive in mid-air, with nearly a complete Target sign in the background. The Mirror Gold parallel adds a gold foil background, and collectors could pull one in every nine packs. Fans continued to collect the 1994 Topps Finest Refractors after the popularity of the 1993 product. Averaging 1:10 packs, the '94 Refractors were sometimes difficult to distinguish from the base without placing them under direct light. 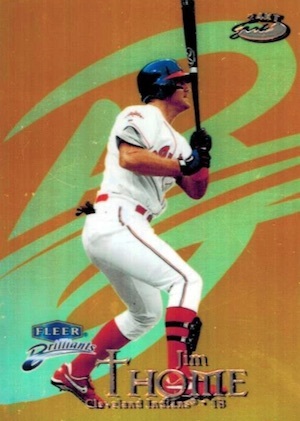 The Jim Thome card was also offered in a release of 40 pre-production cards that were inserted into 1994 Topps Series 2. Those cards are differentiated from the standard 1994 Finest cards with a stamp that reads "pre-production" on top of the statistics. 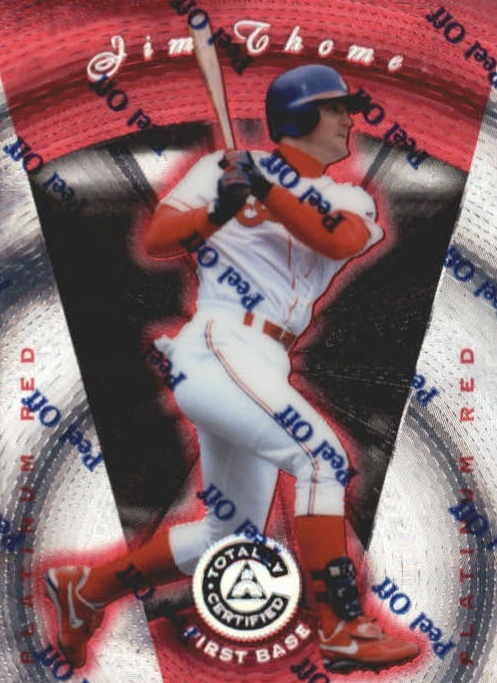 Thome's 1997 Pinnacle Totally Certified release comes in Platinum Red, Platinum Blue and Platinum Gold versions. However, Totally Certified doesn't have a base set that most collectors would typically expect. Instead, every pack contains two numbered red cards, as well as one blue or gold parallel. The Gold Platinum versions are extremely rare at just 30 cards available for each player. 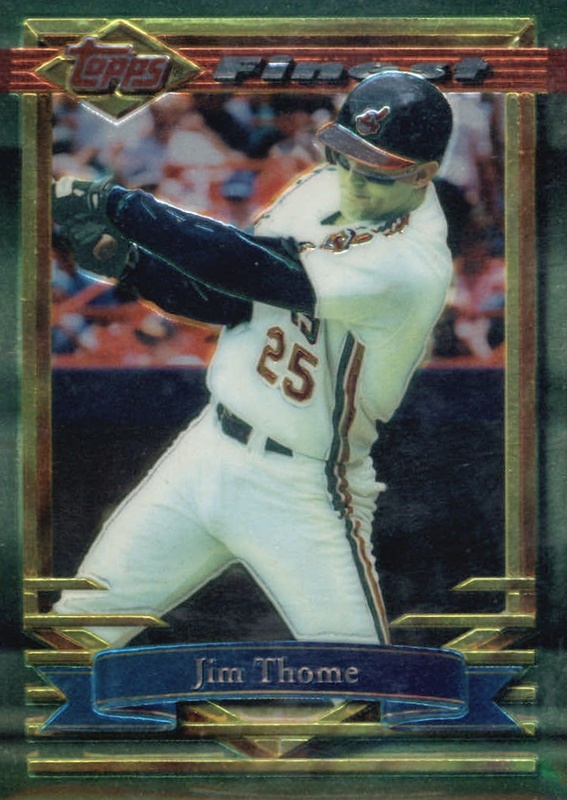 1998 Donruss Crusade works with several different designs in the 130-card set that was released over four Donruss products, and Thome was included in Call To Arms. The Crusade cards also came in three parallel versions of green (250 copies), purple, limited to 100 copies, and red with just 25 copies. Overall, Crusade attracts some of the highest prices for any Donruss card and if it wasn't for Pinnacle's bankruptcy, the set could have continued on for many more years. 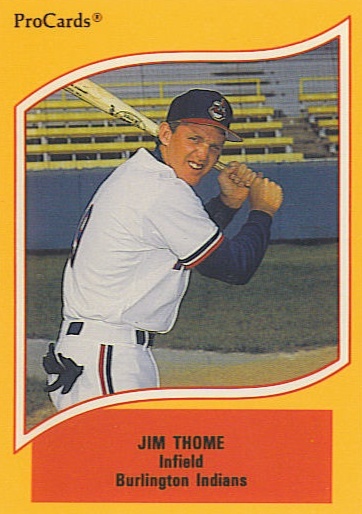 Going to the very start of his hobby career, Jim Thome had several minor league cards before debuting with the Indians in 1991. One of his first pre-rookies was this orange-bordered 1990 ProCards release for players in single-A and double-A minor leagues. 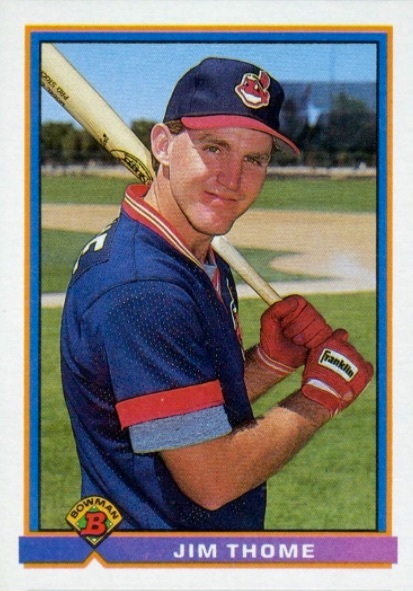 Thome is shown as a member of the Burlington Indians, which was the rookie developmental team for Cleveland. He is generically listed as an "infield" prospect on the front of the very basic card. 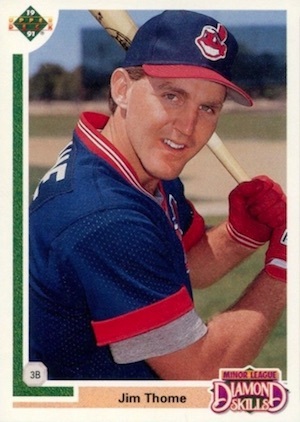 While collectors will have no problem finding copies of the two Jim Thome rookie cards, the low total is surprising since it was commonplace to issue cards for prospects who hadn't played in the majors yet. 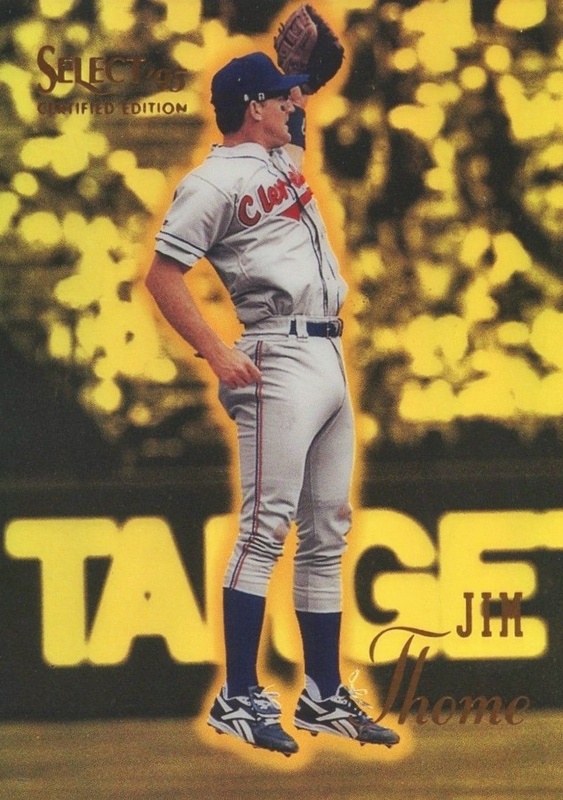 The back of Thome's 1991 Bowman card is blank as he wouldn't be called up until September. Thome is featured with the bat resting on his shoulder but he became famous for pointing his bat toward right field before the pitcher began his windup. In terms of scarcity, values for both of the Jim Thome rookie cards suffer from overproduction. Not issued in the main 1991 Upper Deck set, Thome's 1991 Upper Deck Final Edition card has the advantage of never being found in individual packs as it was available only in a complete set in hobby shops. While update sets from other companies would sometimes get the glossy treatment, Upper Deck's first update skipped that and so there is only one version available. Gem-mint perfect graded copies of Jim Thome's rookie can top $60 at auction. Frank Thomas Jim Thome Gonzalez Delgado UD Bat Around quad gold #'d 50 rare! JIM THOME 2005 FLAIR SHOWCASE LEGACY AUTOGRAPH AUTO #8 34 -PHILLIES H.O.F'er !! !